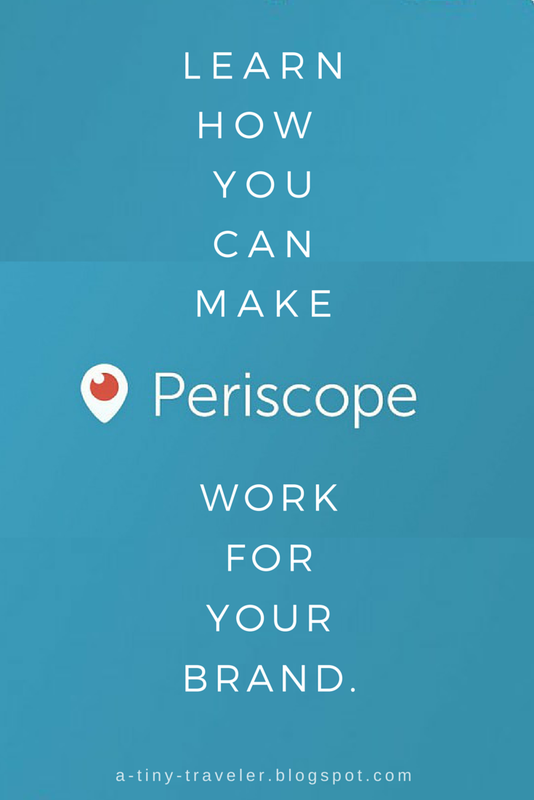 How Periscope Can Work For Your Brand. Periscope is essentially an app that allows you to live stream events and tell a visual story. Visual storytelling. That sounds fun, huh? It gives you an opportunity to become more than some words on a screen to your blog readers, social media followers, and business's customers. It breaks that wall that divides you from your community and provides a way to be transparent and authentic with your audience! If you're considering downloading the app, I highly recommend it because usually groups who jump the curve and beat the rush in things like this are most successful. Use this growing buzz to your advantage fellow bloggers! Another thing that I love about this app is that you can watch celebrities, friends, and companies in a live, raw format. No excessive editing and waiting forever to reach out to your audiences or see what your favorites are up to. Essentially, Periscope is a tool to help brands and customers or supporters to connect faster in a relevant and genuine way. Below I have compiled a list of ways that you can use Periscope to help your website or brand connect with others in the best way and how you can use Periscope to work for you! When are most of your twitter followers active? My audience is usually active in the later afternoon and early evening. That would be my "prime periscoping time." You could honestly start live streaming whenever you wanted, but if your video is not on a time constraint, it would get more attention during your peak twitter follower hours. 2. What Should You Title It? There is an option before you begin broadcasting that lets you give your live stream a title. This is the first big step in gaining viewers. A title that just says "my room" or the name of your business isn't very intriguing. On the other hand you don't want to give too much away! So stay away from a title like, oh I don't know, "Here is my first Periscope where I talk to you about my website that you should all read." I don't think many people will want to watch that one either. I recently made a Periscope called "Why I Love Blogger." It described what I would be talking about but didn't answer the question. It pulled people in, or at least made them wonder "Hmm, why does she love blogger?" This particular video went live around 1pm and didn't retain many viewers because it was sort of a test run. I basically pointed the camera at my computer screen, said "uhmm" a lot, and then gave viewers a nice awkward shot of my forehead at the end because I forgot how to end the video. LEARN FROM MY MISTAKES. When you are broadcasting it is so helpful to connect to twitter. I cannot stress this enough. 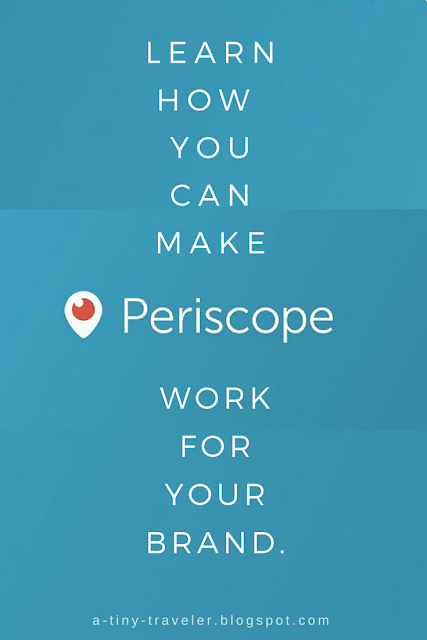 Twitter actually owns Periscope, so they make it really easy to reach your followers. When you write your title before starting the broadcast make sure you select the twitter icon (right below the title) so your twitter account posts that you are live. Then all of your followers will see the tweet and join in on your broadcast! Especially in your first 2-3 live broadcasts, make sure you've prepared ahead of time. It's important to know what you're going to talk about and what types of things you want to cover. If you're announcing a new product, be sure to get excited for it, smile, and let your viewers know why it's important. Getting nervous, saying "Uh" a lot, and looking around the room trying to think of something to talk about can get a little distracting and make viewers log off. I'll be honest, I have some crazy acne on my forehead right now so I'm going to try to limit showing my face to viewers until that clears up. When you're talking to the camera on Periscope, make sure you're in a well-lit space, you aren't in your pjs (unless you're doing some kind of theme), and you're awake. Your viewers want to hear what you have to say; they're interested in you and your brand! Let them see you at your best and be intrigued to what your brand can offer. This is the most important piece of information. If you talk with a fake accent, pretend to be 100% perfect, or you act like who you think viewers want to see, then you've got it all wrong. I mean, maybe the fake accent is cool... maybe. But you don't have to make sure you've got that one name brand thing in the background or try and impress everyone with the amount you've spent on your blog design. Just be yourself, say what you have to say, and have fun! Throw some confetti during a big reveal, play your favorite songs softly in the background, smile, and be welcoming to viewers. Something I think is really cool about Periscope is that you can interact with viewers and comments live. If someone leaves a comment or asks a question, you can address it right then and there! Be engaging and let yourself shine through the video. I hope you got some ideas and tips for your journey into the world of Periscope! If you have any other ideas, feel free to leave them in the comments below and let me know how Periscope is working for your brand! While you're at it, follow me here and let's get connected!